You might think getting a nice, even coat of stain and varnish on your new floor is the tricky part of refinishing a floor, but it’s not. Getting all the old stain and varnish off can be just as difficult, if not more. Sanding to the right levels is crucial for the evenness of the floor, for an even finish and for removing imperfections. In some cases, we may only need to “screen” the wood, which is where you simply roughen the existing finish instead of taking it all off. A pro can assess such things and make the right call. The goal of sanding is to prepare for finishing, and ideally to perfect the floor beforehand. Inexperienced sanding, however, can cause serious issues. It may lead to gouging or to sanding against the grain, destroying the gorgeous patterns of your boards. No good! Most people don’t think about dust containment, but it’s just as critical as any other part of the process. An improperly prepped workspace can lead to dust in every corner of your home, in furniture fibers and more. Containing all that sawdust is crucial, but hard to do. Some boards come unfinished and need treatment in the home to give you that beautiful floor effect, but that takes expertise. Not all stains, no matter how lovely they look on the can, go with all types of wood. Some stains will conceal gorgeous grain, for instance, while others simply don’t show wood off to best effect. 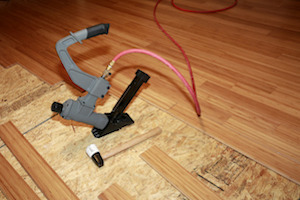 We have the techniques needed to ensure your new hardwood floor shines. You have to assume you’ll need to fix your floor at some point, which means you have to plan for the future. That looks different for different types of floor, though. For hardwood, you may just need a few extra boards (but must still plan on refinishing the floor if you have to replace boards). And while laminate flooring may have real hardwood veneer, and therefore look as though sanding and refinishing will be easy, beware! If you have a problem with laminate or veneer flooring, you’ll definitely need extra boards, and often a whole new floor, because you usually can’t fix them. These secrets and others make it very difficult to get your flooring right, which is where professional hardwood floor installers come in. At Atlanta Floors, we’re here to help, so let us know what you need ASAP by calling 404-915-5054 or getting in touch with us online today!